LONDON, UK – 2007 ended with a murder threat to all cyclists from a prominent newspaper columnist. It started with the death of a well-known British bike shop owner. In January, Mel Vasey, owner of Quinns Bike Centre, was killed while on a Sunday morning training ride with Birkenhead North End Cycling Club. A man was arrested, accused of causing death by dangerous driving, a particularly British social ill. In December, ex Tory MP Matthew Parris alarmed Britain’s cyclists when his weekly column in The Times started "A festive custom we could do worse than foster would be stringing piano wire across country lanes to decapitate cyclists." Both stories are linked by an almost pathological hatred of cyclists from some sections of British society yet despite the fear and loathing cycle use continues to rise in the UK. If the fringes of the year were all bad news, the middle of the year was wall-to-wall positively. London’s staging of the Tour de France send-off went like a dream. The sun shone on the righteous: millions of Londoners and visitors enjoyed the freakish, suddenly gorgeous weather as the Tour carnival hit town. There were no drugs scandals while the Tour was in London, allowing the normally abusive-to-cycling British press to wax lyrical about pro-cycling, a sport rarely featured, British newspapers usually only feature football, cricket, rugby, horse-racing and…darts. The great weather, brilliant racing and ultra-positive reporting didn’t last. Just as the Tour started to descend into what the newspapers predictably called the Tour de Farce, the wet weather returned to the UK. In fact, this was the norm for 2007. Aside from the few days when the French ruled in London, most of the rest of the year was a wash-out. The sun was a mystery object. 2007 was wet, soaked, drenched, water-logged and sopping. It was a rain-blasted year that should have seen bike sales plummet to record lows but, miraculously, sales seemed to be steady, an indication that the burgeoning British bicycle culture is no flash in the pan. Much of the steadiness was due to the rapid acceleration of city cycling in the UK. 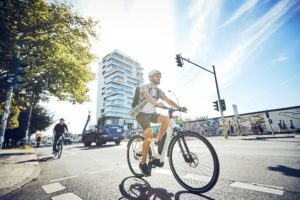 Even during the wettest, coldest, foulest part of the year – in 2007, this was the Summer – the ‘new’ cyclists attracted to urban cycling in the last couple of years did not drop away. In urban centres – and especially in London – cycling continued on its surprising, where-did-that-come-from growth curve throughout 2007, prompting commentators to now fear that any long stretch of fine weather in 2008 could create a bike drought in the UK. Cycle use rose throughout 2007 but not because of any shiny new infrastructure, not because of any huge financial commitment from central Government and not because of any sudden advertising campaign telling people to get on their bikes, and most definitely not because of fair weather, usually said to be the key factor for cycle use in the UK. Cycle use is up because the time is right. London is still a downright unfriendly place for a cyclist but that’s not stopping new cyclists from joining the fray. And as each new cyclist joins the bunch of bikers on the green advanced stop line boxes at the front of traffic lights, it’s easier for cyclists to pull away and harder for drivers to overtake. Bit by bit, cyclists are taking over. London’s bike shops have never had it so good. For a start, there are a lot of London bike shops and the biggest – such as Evans Cycles – is now so big, the independently-owned chain has come up on the radar of retail analysts and, throughout 2007, there was constant mainstream media chatter about the sale of the group. The British press may run hateful articles about "Lycra louts" but this isn’t stopping the growth. Market research company BMRB claims that since 2001 there has been a 40% increase in the number who regularly cycle. Today, 3.2 million British adults cycle regularly compared to 2001 when the figure was 2.3 million. In fact, more people are now cycling regularly than participating regularly in football, golf, jogging or athletics. For 1.2 million people cycling represents their only sporting activity, 30% more than in 2001. James Smythe, head of BMRB Sport, said: "It seems adults are getting the message about cycling’s health and transport benefits outweighing the risks." As well as more people taking part in cycling for exercise and leisure purposes, BMRB believes there is also evidence that more people are commuting by bicycle. 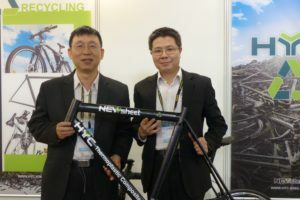 Of the 3.2 million regular cyclists, 1.5 million also use their bicycles as a method of transport, almost 20% more than in 2001, and the number of people in full time employment that cycle regularly has increased by 35% in the last six years. So, cycle use was up throughout 2007, despite the poor weather, and bike retailers of all sizes benefited from the surprising resilience in the market. But fears of an impending recession – think sub-prime mortgage write-downs in the US, the near collapse of Northern Rock and the softening housing market – meant that most retail businesses in the UK had a poor final quarter of the year. 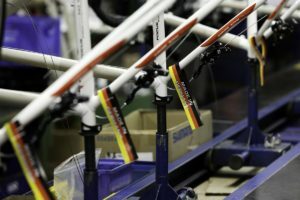 Bike shops benefited from a slight extension of the season as Autumn weather was largely warm and settled, but Christmas sales were poor, anecdotally well down on Christmas 2006. And whereas 2006 was notable for the overwhelmingly positive coverage from newspapers such as The Independent (it famously devoted a front cover to cycling’s ‘revolution’), the last few days of 2007 showed how quickly such positivity could be punctured. The Matthew Parris death threat to all cyclists was never pulled from Times Online but the famous columnist later apologised, blaming cyclists for taking his ‘joke’ seriously. However, Britain’s cyclists had been up in arms over his comments, writing to the Press Complaints Commission in record numbers. And Britain’s bicycle businesses didn’t see the funny side either. Rod Turner, owner of Freewheel in Nottingham said: "It is odd how much cyclists are hated, and by a surprisingly large number of people. Personally I think it’s because we make cars slow down occasionally." Andrea Casalotti of über-cool London bike shop Velorution said: "Two Muslim youths were found guilty of soliciting murder for chanting “Bomb Denmark” at a demonstration. How can anyone argue that what [one of them] shouted was worse than what Parris has written? One claims it was a slogan, the other says it was humour. If anything, it is the latter which can have more nefarious consequences." Touring and campaigning organisation CTC waded in: "Should another article like this appear in the Times, or any other newspaper, we will seek legal advice about bringing a private prosecution against the author. Journalists must recognise that it is not acceptable to incite violence against cyclists, even if they have nothing interesting to write about and a deadline to meet." In the second half of 2007, London’s new love affair with the bicycle – Ken Livingstone is cupid – was ramped up a notch with the revelation that Transport for London wants to have a Paris-style hire bike scheme, modelled on Vélib. 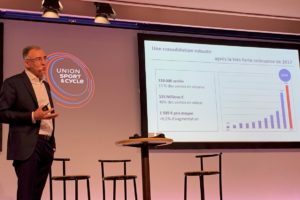 It’s believed London could soon roll out a scheme twice the size of Vélib in Paris, with 20,000 hire-by-the-hour bikes. If Matthew Parris and his ilk fear the rise of cycling in the UK, they’re going to hate 2008. In February 2007, Retail Week reported that Evans Cycles was up for sale, a story that made many appearances in the mainstream media throughout 2007. Retail Week guessed that Halfords would be interested in acquiring the 25-store IBD chain. However, the story turned out to be about acquiring a minority partner not an outright sale of Evans Cycles. Evans MD Mike Rice said this search is in order to "accelerate expansion". Gary Smith – who, along with his son, owns the majority of shares in Evans Cycles – said: "We’re always being approached by people who want to buy us. We’re definitely not for sale. We are, however, interested in taking on an equity partner to fund expansion." For the year to October 2005, Evans Cycles had sales of GBP 25.2 million (€ 33.8mn) with an operating profit of GBP 973,555 (€ 1.3mn). The company projected sales of GBP 45 million (€ 60.3 mn) for 2007. The mainstream media reported that one such outside investor sniffing around the chain was retail billionare Mike Ashley, owner of chainstore Sports World, outdoor brand Karrimor and Lillywhites, the sports shop. Ashley also owns a 29.4% stake in Blacks, the outdoor shops. Evans Cycles has a store-in-store concession in the Blacks store on the outskirts of York. The number of cyclists on the capital’s major roads increased by 6% between March 2006 and March 2007. The number of cyclists in London has soared by 83% since 2000. The bike spike means there were an estimated 480,000 cycle journeys every day across London, around 30,000 more than 2006. More than three million spectators watched the Tour de France as it raced through London and southern England. According to Transport for London, the Tour de France’s legacy to London was a 10.5% per cent increase in the number of people cycling on the Capital’s major roads in the six months from April to September compared with the same period in 2006, with an estimated 48,000 more cycle journeys everyday. The Mayor of London and Transport for London have increased investment in cycling by 50% this year from GBP 24 million (€32.1mn) in 2006/07 to GBP 36 million (€ 48.2mn) in 2007/08. In 2000 investment in cycling stood at just GBP 5.5 million (€ 7.4mn). Despite the fact that it is UK’s biggest bicycle seller by far, Halfords can’t always get the bike brands it wants. It often struggles at the top-end, with brand heroes such as Specialized preferring to stick with IBDs. The chain therefore attempts to create brand heroes of its own, especially in terms of price. But 2007 saw the launch of a bike brand that hit the ground running because of the name on the downtube: cboardman. In actual fact, Halfords doesn’t own the Chris Boardman bike brand but it had an exclusive on the brand’s first products. Britain’s Olympic gold-medal winning Chris Boardman is well known in the UK. Covering road, mountain and commuter cycles, the first Boardman range was available exclusively in Halfords although a high-end range will be available in IBDs in 2008 and the brand has signed riders such as Nicole Cooke, the Welsh wonderwoman. Boardman is also the director of research and development for the highly successful Great Britain cycling team. The Boardman Bikes brand is headed by Alan Ingerfield, a former UK Ironman champion. The brand’s retail and marketing advisor is Terry Bowles, former MD of Madison. Also on board is designer Dimitris Katsanis, creator of the UK Sport Institute bike, British Cycling’s official bicycle. Overall, the first half of 2007 saw an 8.5% sales uplift for Halfords. For the 26 weeks to September 28th revenue increased to GBP 400.7 million (€ 536.9mn). Profit before tax was GBP 47.6 million (€ 63.8mn), a jump of 16.4%. 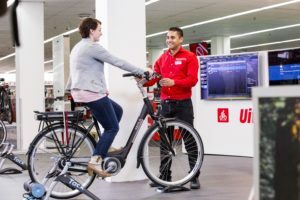 CEO Ian McLeod said: "The cycle market is enjoying a period of encouraging growth, through a combination of leisure, environmental, fitness and commuting needs. During the first six months, we introduced over 100 new models under the Apollo or Carrera branding. Apollo is now the UK’s leading cycle brand. "Our exclusive premium range of Boardman cycles and cycle accessories, developed in partnership with Chris Boardman OBE, is exceeding our expectations. Initial sales are very encouraging." Raleigh’s latest financials show the company with a profit of GBP 1.2 million (€ 1.6mn) on turnover of GBP 31 million (€ 41.5mn). In 2002 the business lost nearly GBP 6 million (€ 8.0mn). All good news. But the bubble was burst in November 2007 when a business profile of Raleigh MD Mark Gouldthorp in the Guardian newspaper likened IBDs to ‘Steptoe and Son’, a 1970s sitcom about a rag-and-bone father-and-son team. Gouldthorp said: "I have spent my whole career working for classic British industries that couldn’t organise a piss-up in a brewery – 15 years at ICI, eight years at ICL. The management spent 90% of their time rearranging the deckchairs on the Titanic. "It is soul destroying. So to come to Raleigh at the point where it has got the chance of a new life is a tremendous opportunity." But Gouldthorp was soon forced on the defensive after criticisms of his own customers. Gouldthorp admitted saying: "It is real Steptoe and Son stuff. Most of them will turn the lights off on a sunny day to save a bit of electricity. If you want to imagine the typical independent bike dealer, he is 50-60, highly cynical, miserable, moaning, scruffy. That’s my customer. It is great." Gouldthorp later claimed the interview with the Guardian reporter had been partially "tongue in cheek" but had also been "taken out of context". When asked whether seeking the business profile in the Guardian was anything to do with chairman Alan Finden-Crofts seeking a buyer for the company, Gouldthorp said it wasn’t. "We’re not for sale. The company is growing and is successful. I am keen to get that message across to the public. PR is a cheap way of doing that."